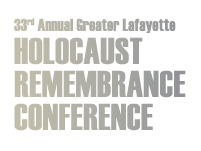 The 2014 Greater Lafayette Holocaust Remembrance Conference Educator Workshop features Johanna Reiss, whose autobiographical account of hiding from the Nazis as a young girl in Holland, The Upstairs Room, is a Trophy Newbery book. During the workshop, Johanna Reiss will tell the unforgettable story of her life in hiding and her eventual release. All workshop participants will receive a copy of The Upstairs Room and a packet of related teaching materials. To register, email Todd Golding, Jefferson High School World History teacher, (tgolding at lsc dot k12 dot in dot us). Please indicate your meal preference (vegetarian or non) and your interest in receiving a PGP certificate. Space is limited to 50 participants, so register early and please forward this information to interested educators. When the German army occupied Holland, Annie de Leeuw was eight years old. Because she was Jewish, the occupation put her in grave danger-she knew that to stay alive she would have to hide. Fortunately, a Gentile family, the Oostervelds, offered to help. For two years they hid Annie and her sister, Sini, in the cramped upstairs room of their farmhouse. Most people thought the war wouldn't last long. But for Annie and Sini -- separated from their family and confined to one tiny room -- the war seemed to go on forever. Johanna de Leeuw Reiss has written a remarkably fresh and moving account of her own experiences as a young girl during World War II. Her picture of the Oosterveld family with whom she lived, and of Annie and Sini, reflects a deep spirit of optimism, a faith in the ingenuity, backbone, and even humor with which ordinary human beings meet extraordinary challenges. In the steady, matter-of-fact, day-by-day courage they all showed lies a profound strength that transcends the horrors of the long and frightening war. Here is a memorable book, one that will be read and reread for years to come. Educators interested in applying for an Engel Award should contact Sarah Powley, Co-Chair of the GLHRC. The window for submitting proposals will open in the fall. Applications will be due January 31, 2015.